I often hear Christians talk about Satan, "The Great Deceiver". When I tell them that I am quite confident there is no such being, they ask me how can I be so sure? Therefore, I decided to write this article to explain why I find the existence of such a being to be extremely implausible. So who is Satan? Satan is supposedly a powerful, supernatural being created by God. God intended Satan to be good. Yet Satan turned evil. How is it possible that God--from whom only good things come--created a supernatural being that turned evil? Right off the proverbial bat, this seems to make the idea of Satan hard to believe. Note that Matthew 7:18 says, "a good tree cannot bear bad fruit." How could the "bad fruit" of Satan have come from the "good tree" of God?" Say that God did create this supernatural being that turned evil. How is it possible that an omniscient God would not know that Satan would turn evil? Actually, some have argued that God did know it would happen, so let's look at the question from both angles. If God did know Satan would turn evil, why would God have created Satan? If I made proverbial widgets, and I could tell that one of my widgets wasn't going to meet my needs, wouldn't I be a fool to make it anyway? If God knew his creation would turn evil, and created Satan anyway, doesn't that mean God wanted Satan to turn evil, or that He was at least ambivalent about it? Some have said that Satan's turning evil was known, and taken into account in God's long-term plan. But why would an all-good God need an evil Satan in His long-term plans? One would think that an all-good God would be able to enact whatever plans He has without need of an evil super-being. So what if God didn't know that Satan would turn evil? Wouldn't that mean that God is not omniscient? Some argue that because of free will, God's omniscience does not give God the ability to know what decisions will be made by His creations. So perhaps, by giving Satan free will, God did not know what Satan would do. But shouldn't a perfect God at least have considered the possibility and made some sort of contingency plan? Let's move on and assume that somehow Satan did turn evil--whether or not God knew it would happen. Why did God not immediately destroy Satan? Or, if God doesn't want to destroy his own creations, why did God at least not immediately contain Satan, perhaps lock him up in hell? Or take away his supernatural powers? I think that Christians say that God will do this at the time of judgment. Why wait? Why let Satan do evil in the meantime? If God can stop Satan now, and doesn't, isn't God guilty of allowing evil? Isn't God acting as an accomplice to evil? Now let's assume that there is some explanation for this. So we have Satan, a powerful being, who is intent on corrupting man. Why does Satan only do things surreptitiously? For example, why doesn't Satan shoot intense pain through every human on Earth until they confess their allegiance to him? I know that Christians say God acts as a "hidden God" because He wants to see if we will freely choose Him. But it seems unlikely that Satan, a pure evil being, would have any such motivation. So why doesn't Satan just come on down and kill everybody or do whatever evil he feels like? Maybe God wouldn't allow Satan to act so bold? Then why does God let Satan operate surreptitiously? God allows Satan to do surreptitious evil? This doesn't seem to make any sense. One explanation, offered by apologist Dr. Hugh Ross, is that Satan is not allowed to tempt us more than we are capable of withstanding. So I suppose that means that nobody is ever successfully tempted by Satan, right? If they are, then by definition, they have been tempted more than they can withstand, right? I suppose Dr. Ross is saying that Satan is only allowed to tempt us to the extent that God expects us to be able to withstand. But how could this really work? If Dr. Ross is right and God limits Satan's evil, then is Satan constantly asking God, "hey God, can I, like, shoot massive pain through Joe's body and see if that turns Joe against you?" And God says, "no, Satan, you may not." And then Satan asks, "well--can I, like, kill Joe's baby and see if that turns him against you?" And then God says, "oh, okay, Satan, I guess you can do that." You might think I'm being sacrilegious but the point is that, although some theologies may sound logical when you read them in a book, when you try to take them off the pages of the book and see how they work in actual practice, they are exposed as just being pat answers that have no real value. It seems to me, then, that either option, Satan self-limits his evil for some reason or God limits Satan's evil, isn't very believable. But say I'm wrong, say that one or the other of these explains why Satan's evil is at least somewhat constrained. However, if Satan does anything at all to influence man, how can man be said to have free will, given that Satan has supernatural powers and we don't? How can God really expect us mere mortals to be able to withstand any temptation by a supernatural evil being? If Satan can use supernatural powers--even "a little bit" against us mere mortal humans--how can we truly have free will? At least a few Christians believe, for example, that Satan placed fossils on Earth to mislead man into believing in evolution. I know that most Christians do not believe this, I simply found this a convenient example. So let's suppose that Satan did leave the fossils. If true, this would mean that we cannot believe anything we see, or any of what our senses tell us--they could just be satanic delusions. How can we have free will if there is nothing that we can know with certainty? Thus I say again, if Satan can use any of his supernatural powers against us, then free will does not exist. By the way, does Satan not know that God is omnipotent? How dumb could Satan be to think that he could possibly win out against the omnipotent Creator, the Creator of everything including even himself? Some Christians say that Satan does know he will eventually lose, but that he just wants to take as many people down to hell with him as he can. But how could Satan have ever been dumb enough to even consider revolting against God, knowing full-well that he could not possibly win? And how could have a third of God's angels have been dumb enough to join Satan, as they too should have known from the beginning that they have no real chance to win? Also, what is the reason for God not revealing Himself to us in obvious ways? When a skeptic asks that question, Christians will often answer that God feels that if we were to have absolute proof of His existence, we wouldn't have the free will to reject Him. Yet Satan, even though he had proof-positive of God's existence, was still able to choose to disobey God. So if Satan could have proof-positive of God and still have free will to disobey God, then why can't we have proof-positive of God? Finally, if Satan could become evil because of free will, how will God ever solve the problem of evil? Couldn't tomorrow, some other creation of God use its free will to turn evil? Couldn't this continue to happen for all eternity? How can heaven be any better than Earth if it is subject to the same problem of free will allowing beings to choose evil? Let me summarize. I don't believe an all-good God could have created a powerful, supernatural being that turned evil. But even if I am wrong, I don't believe an omniscient God could not have known it would happen, or at least make contingency plans. But if somehow this evil Satan did come to exist, I don't think that an all-good God would let Satan continue to do evil. But if God did let Satan continue to do evil, I don't think an all-evil super-being would be restrained or act surreptitiously--he would use his supernatural powers however he felt like it. But even if this evil being was for some reason at least somewhat restrained, the fact that he, having supernatural powers, could have influence over us mere mortals would mean that we don't truly have free will. So, from start to finish, the concept of an all-evil, super-being Satan is untenable. 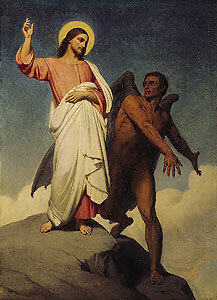 One reader said that Satan has no supernatural powers at all, he merely has the power of suggestion. Well, exactly how does Satan present his "suggestions" to people? Does he knock door-to-door, or hand out leaflets? Even the power to "suggest" seems to include some form of supernatural power--unless he is just knocking door-to-door. Besides, I don't think the idea of Satan merely having the power of suggestion is Biblical. For example, in the Book of Job, Satan kills Job's children and servants. He had to ask God permission, who--great guy He is--gave it. But the point is, Satan didn't "suggest" the people to death, he must have been able to enact something. Also, Revelation 18:23 talks about how the "sorcery" of Babylon (as empowered by Satan) deceived other nations. So, the idea of Satan not having any powers beyond the power of suggestion doesn't seem to work. Many readers have taken objection to my "Satan left the fossils" analogy, saying that very few Christians believe that Satan created the fossils and therefore it is a poor example. I'd agree, except I can't think of any concrete example of something that most Christians do agree that Satan has done--at least in modern times. Some people will say that Satan was involved in this or that catastrophe, while other Christians will say that Satan wasn't involved. I think most Christians believe that Satan is involved in all sorts of dastardly deeds, but as far as I can tell, there seems to be very little consensus on exactly what these deeds might be. If someone can give me a good concrete example of something that most Christians would agree that Satan has done (and I'd prefer a modern times example, not a Biblical example) then maybe I'll revise my analogy. Until then, I think my "Satan created the fossils" analogy is as good as any. By the way, a reader who is a former Christian turned atheist offered a suggestion for a different analogy--she suggested using the Antichrist as an example of something most Christians believe Satan is doing. Satan is supposedly preparing to unleash the Antichrist upon the world. She also noted the Revelation scripture about Babylon's sorcery as support for my contention that God seems to expect man to resist Satan's supernatural powers. Her suggestion is a pretty good one--but to me, it is still too vague. What, exactly, is Satan doing with the Antichrist in their preparations? Again, I don't think I could find much consensus among Christians on how the Satan/Antichrist planning sessions are proceeding. So, I think I'll stick with the fossils analogy for now. Copyright ©2003 Internet Infidels, Inc. Reprinted with permission. All rights reserved.